Started in 2001, bikerkiss.com was the first online dating service for bikers. 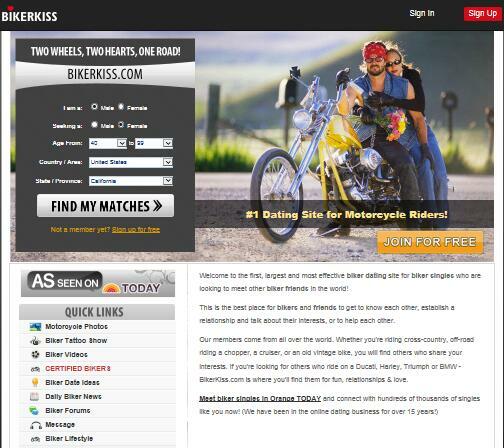 Currently, bikerkiss.com is the largest and most effective biker dating site for biker singles who are seeking to connect and meet with other biker singles and friends in the world. This is the best website for bikers to get to know each other, make friends, establish relationships, help each other and talk about their interests just to mention a few. The website has been improving its design and features for the last 15 years of existence to offer better user experience and to be more effective in helping bikers find their perfect match and true love. The U and navigation is extremely easy to use and even if you’re new to online biker dating, you’ll be able to understand and use easily the feature on bikerkiss.com. The search system is useful, effective and powerful. This makes it easier and quicker for you to search, brows all local single bikers in less than 30 seconds. Joining and creating a profile on bikerkiss.com is free. It allows you to upload 26 personal photos and more than 40 other pictures of motorcycle and tattoos and so on. When it comes to displaying your details to other members, there are many ways to do that. member are not allowed to access all features. However, they can browse and search all available profiles through the site. Gold members enjoy more privileges and therefore, it’s not free. Gold membership pricing is based on the duration of the membership package you choose. Precisely, 1-month gold membership subscription fee is $29.99; 3-month gold membership will cost you $59.95 while 6-month gold membership subscription fee is only $ 95.95. The sign up process on bikerkiss.com is very easy, simple and quick. Even if you’re new to online dating, you’ll be able to create an impressive profile with details. Every single page has a note that guides new users who might not know what to type and the website provides you with a sample to check how to go about everything. To ensure that users provide sufficient information about themselves, signing up to bikerkiss.com account is divided into 4 steps. Providing information that is more detailed increases the number of results that the site will offer in the search result. The information you fill helps a great deal in your dating process because it enables your potential match to find your profile when they’re searching the keywords. The more information you fill, the higher your chances of getting in touch with like-minded bikers. Having considered every aspect of bikerkiss.com, we can confidently say that the site has many amazing and useful features that make the online dating easier and effective for bikers. Every aspect of this site, from the color to wording, features and much more, is well designed for real bikers. If you’re seeking to find a motorcycle date, you’re looking for this site.